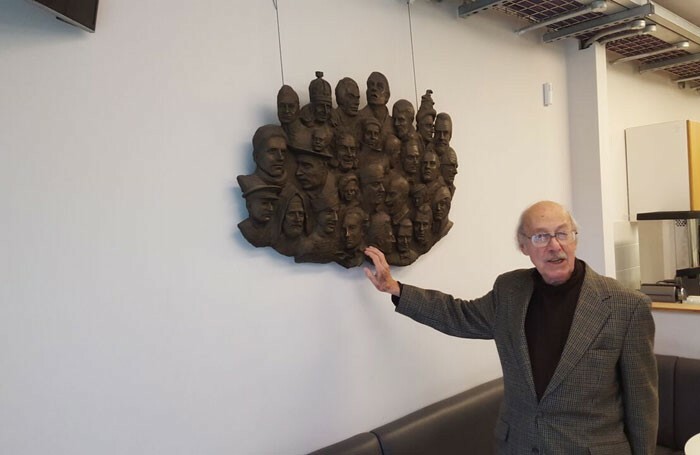 Sculptor Lawrence Holofcener is demanding the return of a bronze Laurence Olivier work he created for Chichester Festival Theatre, if the venue does not return it to its foyer. The bronze bas-relief of Olivier in 24 different roles was unveiled by Olivier in 1985, but was consigned to the theatre’s green room in 2014 after a refurbishment. The artist only discovered its move this week. Chichester Festival Theatre’s theatre manager Janet Bakose said the decision had been made to clear the foyer of all decoration to leave it bare and minimalist. Holofcener said he was “very angry” and added: “This piece was a gift to the theatre in honour of Olivier, paid for by subscriptions from actors such as George C Scott, and it was agreed that it would go on a pillar near the entrance where I thought it still was. “I am angry not so much for myself as for Olivier, the most frighteningly gifted actor and director, yet there is no acknowledgement of him now at the theatre he ran. The public should be able to see it”. Olivier was the first artistic director of Chichester Festival Theatre from 1961 to 1965, before taking on the National Theatre. The artist is best known for his much-loved bronze of Franklin D Roosevelt and Winston Churchill sitting together on a bench, which has become a tourist attraction in Mayfair, London. Holofcener and his wife Julia were visiting from their Florida home to oversee the gift of another cast to the Rose Theatre, the first Bankside playhouse saved from the bulldozers in 1989.